Some police officers are taking unnecessary risks in high-speed chases, a watchdog has warned. The Independent Police Complaints Commission (IPCC) said there were no consistent rules for criminal pursuits and called for compulsory guidelines. The Association of Chief Police Officers has responded by announcing a review of its existing guidelines, which are currently advisory. About 40 deaths related to police pursuits occur a year, the IPCC says. In a major review of road accidents involving police officers, the IPCC said that there needed to be a rethink in how officers chase criminals in vehicles. It criticised the 43 police forces in England and Wales for not having consistent rules governing how and when officers decided whether or not it was safe to pursue a suspect at high speed. The watchdog said it believed codified rules, laid down by the Home Office and Association of Chief Police Officers (Acpo), would be significant enough to cut both deaths and serious injuries. Since the watchdog's launch in April 2004 it has investigated 275 incidents involving 115 deaths and 273 serious injuries. Four out of 10 of those killed were not wearing a seatbelt. The IPCC found that most accidents involved young male drivers under the influence of drink or drugs. Most police chases were triggered by traffic offences. The IPCC said its review had found evidence of unnecessary risk taking where officers could have had an alternative way of resolving the situation. It called for control rooms to take a more active role in whether officers should chase a suspect. The watchdog called on Acpo to tell forces to stop using four-wheel drive vehicles and police vans in chases except where needed for a specific tactic. Nick Hardwick, chairman of the IPCC, said many pursuits were short and involved split-second decisions. "The Acpo guidance on pursuit driving should become compulsory rather than advisory at present," he said. "All of these pursuits are potentially risky and dangerous - for the drivers of the pursued vehicle, other road users and pedestrians and the police drivers themselves." Mr Hardwick said he was concerned at the number of motorcycles and mini-motorcycles now involved in accidents. "The IPCC believes that pursuit of motorcycles can be particularly dangerous as the rider is much more vulnerable than a driver or occupant of a car and the tactical options for bringing the pursuit to an end are very limited," he said. "The danger is that officers initiate a pursuit and without any tactics available to end it simply wait until 'something happens'." Assistant Chief Constable Andy Holt of South Yorkshire Police, the Acpo spokesman on pursuits, said there would now be a review of guidelines ¿ but he emphasised police drivers were highly trained. "These are professional officers working in a difficult environment often having to make split-second decisions," said ACC Holt. "We need to ensure that they have the right level of support." He said however there were concerns from some forces over creating new compulsory rules because of a drive to cut police bureaucracy. Police minister Tony McNulty said he welcomed Acpo's review, but said that the key issue was that the majority of police chases were caused by suspects refusing to stop when requested. Deaths from traffic accidents involving police vehicles make up the largest single group of fatalities following "police contact". In 2004 the IPCC's forerunner said there had been an "unacceptable death toll" from chases involving police cars. 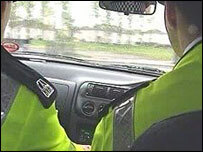 Figures then showed that police were involved in 1% of all traffic deaths in England and Wales. The IPCC later backed calls from rank and file officers for "consistent training" for police drivers to guarantee a national high standard. Many officers currently complained that refresher training for pursuit drivers varied widely from force to force, the IPCC added. The IPCC investigates each of incident even if the actions of police officers played no role in the actual accident, such as when a suspect fleeing a crime scene hits a pedestrian.